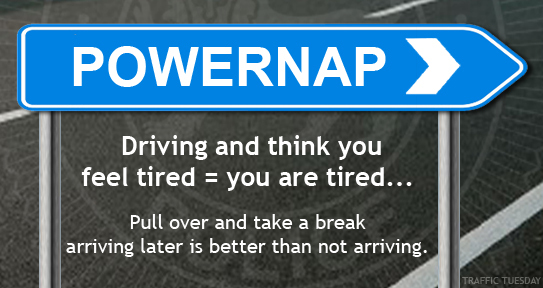 Although we are less likely to drive as far or as long as other drivers on the mainland – driver fatigue is still a potential killer on our roads. Even better take a powernap of even just 5-15 minutes. A small delay in your travel is better than falling asleep behind the wheel, crashing, and not making it to your destination. This page -- https://www.police.tas.gov.au/what-we-do/traffic-policing/traffic-tuesday/30-fatigue/ -- was last published on November 13, 2017 by the Department of Police, Fire and Emergency Management.